I have said for awhile that the US would survive the Trump Era. Apparently it is going to be expensive for us and the planet. Hopefully this will limit Trump to one term. Robbie is Energy Innovation’s Policy Design Projects Manager, and works on Energy Policy Solutions and Power Sector Transformation. The Trump Administration has signaled its intent to roll back existing federal fuel efficiency targets of 54.5 miles per gallon for model year 2022-2025 cars and light trucks, a move endorsed by U.S. auto dealers and auto manufacturers. But going in reverse on fuel efficiency would be a terrible deal for American drivers that would cost the economy approximately $800 billion while adding nearly six billion tons of carbon dioxide to the atmosphere by 2050. Energy Innovation utilized the Energy Policy Simulator (EPS) to analyze the effects of lowering U.S. fuel efficiency standards. The open-source computer model estimates economic and emissions impacts of various energy and environmental policy combinations using non-partisan, published data. It is freely available for public use through a user-friendly web interface or by downloading the full model and input dataset. The real problems with all the “stop turning corn into liquid fuel” noise in the press is that the EPA only has the authority to wave some of it. The rest of the authority belongs to the Clean Air Act and in this respect ethanol is one of the best oxygenators for the fuel which cuts smog and ozone. Added to that ethanol is a cheaper oxygenator by about a buck a gallon so I doubt seriously if the gasoline refiners will give it up. Bottom line is it is a great way to pander to growers and livestock people who have been abandoned by the House of Representatives who could not get a Farm Bill passed. But is not going to free up a lot of corn and even then it will be expensive. Texas Governor Rick Perry on Friday asked the US Environmental Protection Agency to waive its ethanol mandate as a severe drought shrivels this fall’s expected corn harvest. His petition marked the fifth state to formally ask EPA to alter the Renewable Fuel Standard’s requirement for blending corn-based ethanol into gasoline supplies for 2012 and 2013. It comes four years after EPA rejected a similar request by Perry. He said the ramifications of this year’s drought could be worse than the conditions he cited in the 2008 petition. “The forecasts are dire, as crop yield and overall productions are projected to be lower than anticipated,” Perry said in a letter to EPA Administrator Lisa Jackson, adding that ethanol production and the corn market have changed considerably since 2008. Come on. 4 refineries in a 4 state region are effected at the same times by “disasters” that would be easy to contrive. In 2 of the biggest markets in the country, the Great Lakes Region and California. Can that be an accident? Looks highly suspicious to me. One thing is for sure everybody is loving those rising gas prices besides the drivers and President Obama. Maybe that is what they are after, defeating Barack Obama and electing one of their own, Mittens Romney. SAN FRANCISCO — A massive Chevron oil refinery fire that sent hundreds of people rushing to hospitals and is pushing West Coast gas prices higher was just the latest pollution incident at the facility that records show has increasingly violated air quality rules over the past five years. The refinery is one of three such facilities near San Francisco that rank among the state’s top 10 emitters of toxic chemicals, according to the U.S. Environmental Protection Agency’s Toxic Release Inventory. Chevron’s Richmond refinery — the scene of Monday’s fire that shrouded the area in black smoke — has been cited by San Francisco Bay area regulators for violating air regulations 93 times in the past five years. The number has increased from 15 violations in 2007 to 23 in both 2010 and 2011. The refinery is also the state’s largest emitter of greenhouse gases, according to state regulators. Go there and read. State Fair starts today so I may be gone for a couple of days. More tomorrow. Got no more to say than the title. This is some really dumb stuff. Congress mandated purchase of 250 million gallons in 2011. Actual production: 6.6 million. Years before the Obama Administration dumped $70 billion into solar and wind energy and battery operated cars, and long before anyone heard of Solyndra, President Bush launched his own version of a green energy revolution. The future he saw was biofuels. In addition to showering billions of dollars on corn ethanol, Mr. Bush assured the nation that by 2012 cars and trucks could be powered by cellulosic fuels from switch grass and other plant life. To launch this wonder-fuel industry, the feds under Mr. Bush and President Obama have pumped at least $1.5 billion of grants and loan subsidies to fledgling producers. Mr. Bush signed an energy bill in 2007 that established a tax credit of $1.01 per gallon produced. Most important, the Nancy Pelosi Congress passed and Mr. Bush signed a law imposing mandates on oil companies to blend cellulosic fuel into conventional gasoline. This guaranteed producers a market. In 2010 the mandate was 100 million barrels, rising to 250 million in 2011 and 500 million in 2012. By the end of this decade the requirements leap to 10.5 billion gallons a year. Go there and read as long as you can bare it. More tomorrow. Between the nitrogin that they hose around the environment and the methane they spew, we have to change farming if we are going to change the world. We need to make the global economy green. Agriculture provides significant opportunities for growth, investment and jobs to help make this happen. Everyone needs agriculture. Agriculture feeds our entire population and produces fibre for clothing, feed for livestock and bioenergy. Particularly in the developing world, agriculture contributes significantly to GDP growth, leads the way in poverty reduction and accounts for the lion’s share of employment opportunities, especially for women. Agriculture also has one of the highest potentials for reducing carbon emissions and helping vulnerable people adapt to climate change. This all began as a lark. I was bored and could come up with anything interesting that I wanted people to see and think about so I typed in environmental disaster in the google field and picked the one that looked interesting. But it has turned out to be quite fun in a macabre sort of way. Look it is bad enough that Brazil is dozing the rain forest or planting crops in the pantanal; bad enough that they have dammed the Amazon and are running their surface fleet on ethanol. Now they are tossing oil in the ocean. In yet another environmental disaster, off shore oil drilling has caused 416,400 litres of oil to flood into the sea 370km (230 miles) off the Brazilian coast. Chevron claims full responsibility for the disaster that occurred almost 2 weeks ago and has made assurances that the underwater rupture had been sealed although there continued to be residual oil leaking from undersea rock at the Frade Oil Project. The international environmental group Skytruth suggested the spill was 10 times larger than the official estimate and backed up its claim with satellite images. underestimated pressure of underwater oil deposits while drilling, causing oil to rush up the bore hole and seep into the surrounding seabed. Meanwhile, Head of the Federal Police Environmental Division Fabio Scliar voiced concern about the methods Chevron was using to clean up the spill. He said, Chevron was “pushing” the oil to the bottom of the sea, thereby putting corals in the area at risk of destruction. Currently the oil slick originating from the drilling location has extended over 2,379 square kilometers but is dispersing in a clockwise eddy by the ocean currents as it drifts further out to sea. Go there and see the pretty pictures, play the video and read. More tomorrow. I love Brit speak. Some groups are not undecided they are mulling things over. Anyway there is a great list at the end of this article so go check it out. IMPORTANT UPDATE, Jan. 7, 2011: Ten *NEW* communities added to the List of Canadian Transition Communities (below). What is a Transition Community? The following text is excerpted and adapted from Ball’s research paper, Transition Towns: Local Networking for Global Sustainability? The Transition Movement, promoting an action-based approach to (local) sustainability, has in the past four years grown to incorporate a large network of individual Transition Initiatives. Informed by ideas and values within environmental organizations, yet, in its practical organisation it is distinct from past models of sustainability by incorporating broad grassroots support in a diverse range of places within the framework of a coherent networking model. Sustainability challenges the dominant, market-based capitalism of industrial society, on economic, social, environmental and ecological grounds, citing devastating ecological and environmental exploitation. Sustainability, in contrast, calls for production and consumption within long-term ecological limits. While local sustainability has become a politically important goal, in practice neither top-down government nor grassroots community models have gained widespread uptake or success: the former have failed to connect with or involve a grassroots public; the latter generally have few resources and limited capacity. The Transition Model, a non-governmental community-led model, advances an action-based approach. With its fast-growing network of Initiatives, the Transition Movement is akin to a non-profit franchise operation, combining the advantage of a centralized support base with the capacity and resources of a decentralized networking organization. This post was really difficult for me. Riding animals has been a human practice for thousands of years and still is in use in many parts of the world. From dog sleds in the north to camels in the south and horses all inbetween many hundreds of animals have been used to haul humans and freight. In some places humans even haul people in what Americans usually refer to as rickshaws. I contemplated making this a multiple post but the biggest question for me is how this move back to animals as a major form of transportation would restructure our world. How would we feed them all? How quickly would it happen? How many people would have to give way for all of the offset food? Anyway there are so many ways I could have diced this pie that a simple post will have to do. Please try not to think about how much manure this would generate. Some animals are used due to sheer physical strength in tasks such as ploughing or logging. Such animals are grouped as a draught or draft animal. Others may be used as pack animals, for animal-powered transport, the movement of people and goods. People ride some animals directly as mounts, use them as harness one or a team to pull vehicles. Pack animals may be of the same species as mounts or harness animals, though animals such as horses, mules, donkeys, reindeer and both types or camel may have individual bloodlines or breeds that have been selectively bred for packing. 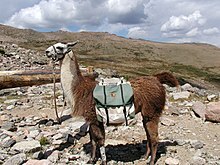 Additional species are only used to carry loads, including llamas in the Andes. Domesticated oxen, bullocks, and yaks are also used as pack animals. Other species used to carry cargo include dogs and pack goats. Homing pigeons transport material, usually messages on small pieces of paper, by air. An intermediate use is to harness animals, singly or in teams, to pull (or haul) sleds, wheeled vehicles or plough. Oxen are slow but strong, and have been used in a yoke since ancient times: the earliest surviving vehicle, Puabi’s Sumerian sledge, was ox-drawn; an acre was originally defined as the area a span of oxen could plow in a day. The Water buffalo and Carabao, domesticated water buffalo, pull wagons and ploughs in Southeast Asia and the Philippines. Draught or Draft horses are commonly used in harness for heavy work. Several breeds of medium-weight horses are used to pull lighter wheeled carts, carriages and buggies when a certain amount of speed or style is desirable. Mules are considered to be very tough and strong, with harness capacity dependent on the type of horse mare used to produce the mule foal. Because they are a hybrid animal and usually are infertile, separate breeding programs must also be maintained. Ponies and donkeys are often used to pull carts and small wagons, historically, ponies were commonly used in mining to pull ore carts. Dogs are used for pulling light carts or, particularly, sleds. (e.g. sled dogs such as Huskies) for both recreation and working purposes. Reindeer are used in the Arctic and sub-Arctic Nordic countries and Siberia. Elephants are still used for logging in South-east Asia. Less often, camels and llamas have been trained to harness. According to Juan Ignacio Molina the Dutch captain Joris van Spilbergen observed the use of chiliquenes (a llama type) by native Mapuches of Mocha Island as plough animals in 1614. Assorted wild animals have, on occasion, been tamed and trained to harness, including zebras and even moose.